52 historic sites across New Mexico! Join the frontier of adventure and discovery with museums, archeological sites, a spaceport, laboratories and more. Each unique and amazing site helps tell the story of New Mexico's contribution to space and technology, from ancient times to the facilities of tomorrow. Bridging science, history, education, and business interests & toursim with the adventure of the New Mexico Space Trail. an amazing stargazing experience for two millennia. 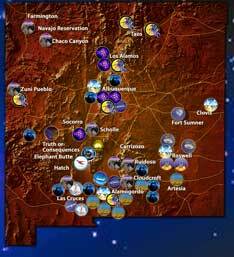 Images of America: New Mexico Space Trail catalogs sites within the state that have inspired humankind to reach for the stars.